A recent announcement by the United Nations that it will begin to mint gold and silver bullion coins bearing the UN logo has raised fears that a new global currency is being readied to replace the dollar, but the story is likely to be a hoax, muddying the waters of the very real move towards a global monetary system. “The United Nations (UN) has licensed the minting of gold bullion coins bearing its logo to provide a “public option” world savings currency,” stated the original story. The source of the story was attributed to both the Vancouver Examiner and Adfero Limited and it featured on the World Gold Council website, but the link to the article now gives a 404 error page. There is nothing on the UNCTAD website to verify the authenticity of the story. Posters on the Ron Paul Forums dismissed the story as a hoax. “I posted this a while back, but there was no primary data source to back it up. Nothing on the UN’s site either, it’s more than likely a hoax” writes one. Others have also questioned how the UN can afford to buy gold to mint its own coins, tying the development in with other suspicious circumstances surrounding alleged manipulation of gold prices. [efoods]“The story, which seems to have had little basis in fact and a lot of basis in speculation or imagination, has now been pulled from the site as it is not factual….The UN only issues commemorative coins.” writes BullionGoldCoins.com. Posters on the Prison Planet Forum questioned the motives behind putting out a fake story about the move towards a world currency, suggesting unscrupulous people were “testing the water” on how the public would react to the announcement. Just like the fake Amero coins hoax story which was put out by disgraced FBI informant Hal Turner, the UN gold story will still be parroted years from now by gullible people unaware of the fact that it’s a hoax. This in turn will allow debunkers to exploit the confusion and claim that the entire one world government agenda is a paranoid invention, when the process of its implementation is publicly announced on an almost daily basis. The all too real move towards a global currency was unveiled at last year’s G8 summit in Italy, when Russian President Dmitry Medvedev displayed a coin to reporters a coin representing a “united future world currency”. This followed comments made by U.S. Treasury Secretary Timothy Geithner to the Council on Foreign Relations, in which he assured CFR globalists that the U.S. was “open” to the notion of a new global currency system to replace the dollar. In addition, the scandal-ridden and highly secretive Bank For International Settlements, considered to be the world’s top central banking power hub, released a policy paper in 2006 that called for the end of national currencies in favor of a global model of currency formats. The march towards a global currency is real, provable and openly documented. The UN gold hoax story has seemingly little purpose other than to poison the well with disinformation, thereby inadvertently detracting credibility from those who are warning of a global government takeover which manifests itself in a myriad of different ways at every major global summit, from the G8 to last month’s Copenhagen conference. The REAL global currency coin, as unveiled by Russian President Medvedev at last year’s G8 summit in Italy. 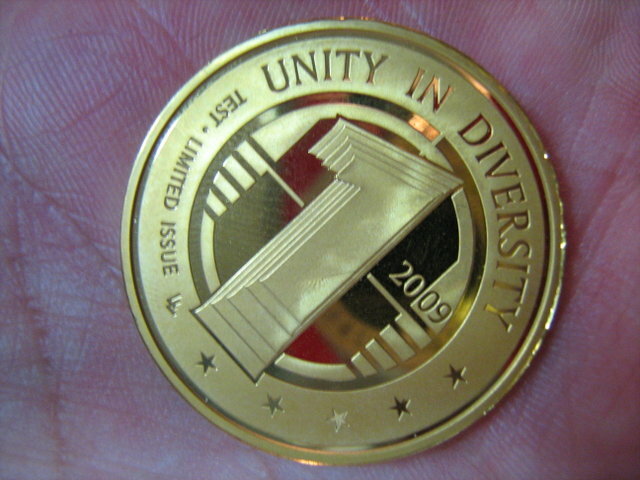 Click here for a larger image of the coin.